There is no one picture that can capture the inexorable rise and reach of Leviathan, but if you had to pick just one, the amount of money spent in the name of each citizen has several merits. The one pictured here is adjusted for inflation so that everything is in constant 2009 dollars (2017 and after are estimates, and likely to be too low). Why is spending important? Each dollar spent is a dollar taken from a citizen or created from vapor, and each requires management and an apparatus for agreement, acquiescence, and distribution between citizens and government. Thus the more that is spent, the larger the influence of the government doing the spending. If the federal government were as small as it was in 1900, it would today spend the same $180 per citizen as it did then. Given population growth, this would imply a current budget of around $59 billion. The actual budget is $3.6 trillion, which is sixty times higher. Customs duties alone would have paid for a good chunk of the $59 billion. And there would have been no need of an income tax. The government is now sixty times more intrusive, sixty times more bureaucratic and Byzantine, sixty times more pervasive. The trend in spending increased fifty-percent over the last decade. It shows no sign of stopping. Your might say, “It doesn’t matter what the government spends as long as it keeps pace with economy as measured by the Gross Domestic Product.” Yet the government spent at the rate of 3% of the GDP in 1900, soaring to 21% now. 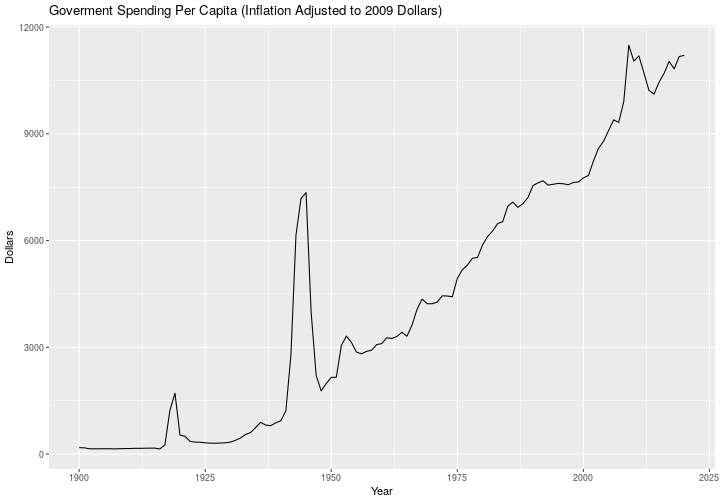 The shape of that curve is not much different than the spending per capita picture. Next you might say, “Sure, the government was small in 1900. That’s because X wasn’t around.” “X” will be your favorite redistribution program, which you see as necessary. Yet every redistribution program is claimed to be absolutely necessary by somebody, even the programs which haven’t yet been implemented. Threaten any with defunding, and the program’s advocates start making sounds like Ned Beatty against a tree. If you can afford it, click here. Regular readers will recall we did this topic four years ago. The article has been completely rewritten, including new data, and a new rousing conclusion, predicting when the spending increases must stop. As long as the citizens trust in fiat dollars, it doesn’t have to stop. The value of currency as — opposed to commodities (typically precious metals) — lies in the trust factor. When people believe that dollars have value, they do. Dollars are blithely traded for labor and in turn the dollars retraded for goods and services. Government can go on printing currency with no inherent value so long as people think it has some. So the underlying question is: — when do enough people reject the fantasy? Such turns are sudden, but like turns in the stock market hard to predict. There may be recognizable signals, but few can turn them into accurate predictions. Bravo!! More citizens should understand this. USG Spending, implying taxes, is a dismal graph to be sure…but Briggs’ summary can leave the casual reader with an overly optimistic appreciation of the situation. It is much worse than many might perceive! Debt, as most know or will someday learn, is an expense that consumes further expenditures–for no benefit. Fiscal Year Total: $458,542,287,311.80 (that’s almost 0.5 Trillion $! […right down to the penny…]). Summary: Monthly interest on US Fed’l Debt varies from about $23B to $90B, depending on the month. The ACA/Obamacare deficit situation is now well known … something needs to be done because the subsidies cannot keep up … and our Republican President and Republican Senate and Republican House are gridlocked … over what amounts to a cost burden that is somewhere between two and eight months of the existing Federal interest payments on the national debt. That’s oversimplifying, but does present some valid perspective. The typical consumer/taxpayer in the same situation: Someone with a $200,000 mortgage, roughly half-way paid off, will have monthly interest payments of about $500. Two to eight months of interest is a bill of about $1000 to $4000, say an unplanned overhaul of the car’s engine — a situation analogous to the ACA bill. Most families of moderate means in that situation can absorb that burden; if they need a carry-over loan eventually that will get paid off. In contrast, our Fed’l government is barely able to sustain its ever-growing debt payments. And most States, and many (most?) large municipalities are in no better shape, many much much worse. If you live by such you may have noticed your State having auctioned off/leased government property to raise needed funds. Virginia, right outside of Wash D.C., has done this with a main freeway, installing toll roads managed by a private vendor where toll roads were never needed before. Many states have sold/leased govt buildings, etc. That’s a sign those governments are nearly at their ultimate limits. But there doesn’t seem to be an end in sight in tax & spending (at least for the Feds) … except for the [inevitable?] “train wreck” when the ability to collect and spend other people’s money ends because other people are tapped out. Debt is a bill paid later that deprives people in the future, and on the government’s spending scale, future generations are being impacted by the current generations taxpayer-subsidized consumption via govt giveaway programs. Curiously, the bulk of those advocating current spending at a rate requiring indebtedness that is sure to deprive future generations are the same ones that want to destroy the economy that creates the funds they spend, by scaling back business, etc. to reduce C02 emissions to save the planet for those same future generations. Fiat dollars? What’s the alternative? Precious metals? Too volatile for my taste. If I want my investments to grow, with a risk-reward level I’m comfortable with, avoiding valuations in dollars doesn’t seem to leave much to choose from. If an economy is growing, I understand that more currency has to be “printed”. And I understand that the government controls the pressing press. But less clear to me is how the printed money enters the economy. Who gets the benefit of the value of that newly minted money without having to barter something in exchange? Is there at least lip-service given to spreading the new money equally throughout the population? For example, government spending that can be said to benefit all, such as infrastructure or common defense? I’ve spent my whole life working in exchange for dollars, and I don’t understand what they really are! Matt’s graph (I think) misses the most important thing, at least now and in the future, because of the way the government has deigned to define ‘Federal’ spending. Social Security, Medicare, and Medicaid are the main drivers of the future spending explosion – none of which the government lists under ‘Federal’ spending (and thus, I think, they don’t appear in Matt’s graph). ‘Welfare’ is included in ‘Federal’ spending, but somehow this doesn’t include those three entitlement programs. I don’t think that those numbers calculate the full expense of these entitlements. Doing so would include how much we’re paying in interest on this money that we invented and then loaned out as a debt obligation (in one way or another) to ‘pay’ for them. Anyway, with just those raw figures from Matt’s site, if my arithmetic is right (please check it!) that’s about another $4000 or so per capita in actual Federal spending, in 2017 dollars – and that’s the number that is going to go up the most in future. In a previous life, I had brief conversation and association with Boston University economics professor Larry Kotlikoff (q.v.). He estimates the present value of our “fiscal gap” (our unfunded liabilities under these entitlement programs – our expenditure until the end of time plus servicing that debt, minus all projected taxes for the programs – as the result of our promises to pay these entitlements in the future) as north of $220 TRILLION. Under Rosy Scenario projections, that number slips to around $85 Trillion. 220,000,000,000,000/324,420,000. Could this arithmetic be right? $678,133 for every man, woman, and child currently in the US? And “present value” means that this money is not due in the future; it’s like a credit card bill the country owes right now. If we don’t pay interest on it, this debt will continue to accumulate. All money, by its very definition as a medium of exchange of goods and services, is “fiat money” in that it only works as money if it can be believed or trusted as a medium of exchange; and it doesn’t matter in the slightest bit if “money” is shells, notched sticks, yellow or silver metal, paper imprinted with fancy designs, a cheque with a signature, entries in a ledger, digital entries in a computer, or a handshake, or an IOU, or anything else that should be honoured as a claim to some property or benefice. The main artifice of the money manipulators is to propagate the notion that money is some magical, sacrosanct, “stuff” that must be worshipped as an end with no beginning. All money is created as a human convenience… it is not a “natural law”… it is not something that is (or should be) limited by how much yellow tin can be dug up, or stolen from neighbours. It is an economic convenience that should be matched to the requirements of the economic activity of the society. The real contemporary problem with money is that some clever operators have convinced a decadent world that money is some magical stuff, neglecting to mention that it is only created as an interest-bearing debt to the society. It is utterly perverse in a logical sense but it accords with the notion that iniquity is its own reward. Previous Previous post: How Suspicious Is It To Win The Lottery Multiple Times?